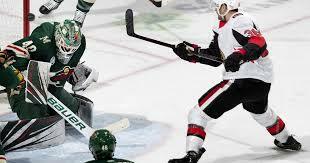 The Wild’s tour of Ontario continues Saturday, with its second stop on a four-game road trip at Canadian Tire Centre to face the Senators. This contest will wrap up the season series between these two teams, as the Wild won the previous meeting 6-4 Nov.21 in Minnesota. The team is also coming off a 4-3 win over the Maple Leafs Thursday, an effort that saw a handful of players contribute offensively. Captain Mikko Koivu scored his second goal in as many games, while winger Zach Parise tallied the game-winning goal and an assist for his ninth multi-point performance of the season. During a four-game point streak, Parise has three goals and three assists. Parise’s linemate Charlie Coyle also chipped in a goal and an assist to extend his point streak to a season-high three games – a span in which he has two goals and four points. And on defense, Jared Spurgeon tied a career high Thursday with three points, which included a goal. Spurgeon also blocked a game-high five shots. With another early start – puck drop is 1 p.m. local time – the Wild did not conduct a morning skate Saturday. The team did practice Friday and although winger Mikael Granlund didn’t participate, instead taking a maintenance day, Boudreau said Granlund will suit up against the Senators. 199: Career goals for Koivu. 3-1-2: The Wild’s record during its last six trips to Ottawa. 26:17: Defenseman Ryan Suter’s average ice time, which ranks third in the NHL. 6: Consecutive losses for the Senators. 25: Points for winger Bobby Ryan in 30 career games vs. the Wild. Hamstrung by injury, Ottawa is second-to-last in the NHL with 15 wins and 35 points. Among the players it’s missing are forward Marian Gaborik (back), defensemen Thomas Chabot (upper bod) and Justin Falk (concussion) and goalie Craig Anderson (concussion). Winger Mark Stone leads the team in goals (19) and points (45). Four others (forwards Matt Duchene, Brady Tkachuk, Ryan Dzingel and Colin White) have hit double digits in goals for the Senators. The team is 11-7-4 on home ice this season.